The Gothic alphabet is scarcely supported and even more scarcely is it well done. Uncial gets old, and I'm fed up with all the ugly attempts to Latinize it. So here's mine. I hope it's less ugly. So, what do you think? 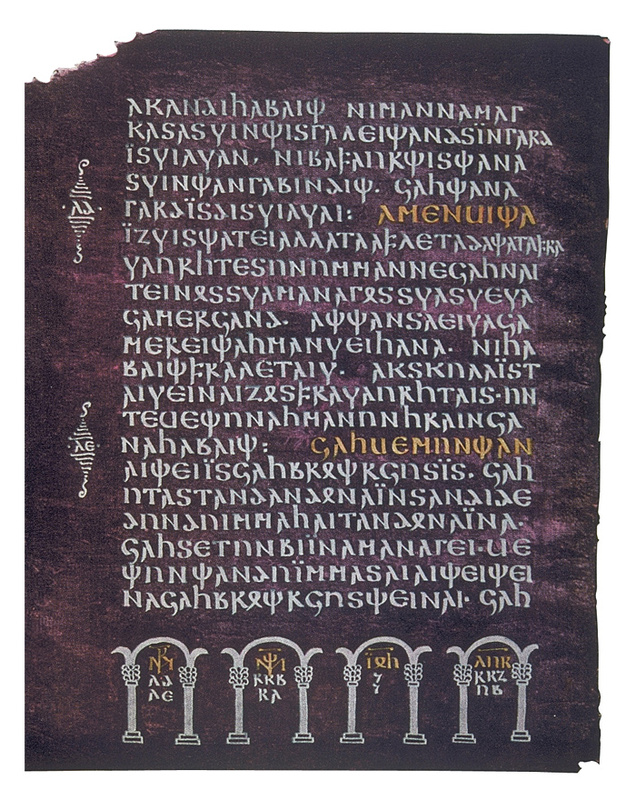 The text shown is the Lord's Prayer, "Atta unsar" in Gothic. I think it contains all the Gothic letters except those used only as numbers or in Greek borrowings. I can post more examples if necessary. Once I settle on the Gothic designs, I think I may extend this to Latin and Greek. Where is it? I cant see it! I keep trying to attach the PDF, but it's not working. Here a PNG if that will work. can you write something in english please ..? I've always liked the look of the Gothic alphabet, and I like this treatment as well. I'd like to see the PDF to take a look at the letters up close. I'd very much like to see something in English too, once you have extended it to Latin. And if you're going to extend it to Latin and Greek, throwing in Cyrillic will only require a few more characters. You'll see that the capitals and lowercase are each the same width. I designed the uppercase first and then the lowercase based on those, mostly just shortening and adjusting. I want them to look similar since Gothic doesn't usually have real capitals; one simply writes a large initial letter. But this causes some of the proportions to be weird. I think I should narrow the lowercase N, at least. Do you think I should adjust the capital too, or is it okay? As for the N, I agree the lowercase is a bit staunchy, but the capital looks great. The problem is that by forcing your capitals do be the same width as your lowercase, you're necessarily squashing them, which is less noticeable on letters like F, E, S, I, Y, etc, because most of their diagonals (if any) are more vertical, and any horizontals are fully horizontal. The N is more noticeable I think because it seems to cross the 45º line betwixt the cases. I think you'd be okay to vary the widths a little bit. Since not all the letters have the same width, it won't be noticeable that the capital and lower versions are slightly different. Omniglot has an example in Alphabetum, which is probably the best approximation of the real thing. This image, sadly, is the clearest example I can find of an actual Gothic text. This comes from the Gospel of Luke (I think—I'm not really sure which) from the Codex Argenteus. This is really beautiful, and I can only say keep up the good work. I find this really fascinating, even though I know nothing about the Gothic alphabet.